Good day Talibon Montessorians! Please be informed that the General PTA meeting which is scheduled on Friday, June 22, 2018 has been postponed to Saturday, June 23, 2018 at 1:00PM. Congratulations and thank you for being with us again this school year. We, the management of TMSI is hoping that you will join hands with us again this year to carry and realize our vision and mission in shaping the future of our beloved children to become good and productive citizens of the country and the world. In this connection, you are humbly requested to attend our General PTA Meeting scheduled on June 22, 2018 here in our school at 1:00 PM. Your presence is needed for the success of our meeting. AGENDA: 1.Orientation on School Rules, Policies and Regulations 2.Class Program and Grading System 3.Programs and Activities for SY 2018-2019 4.Election of PTA Officers 5.Other Matters. Thank you so much. May God give us courage, strength and wisdom to realize our dreams for our children. 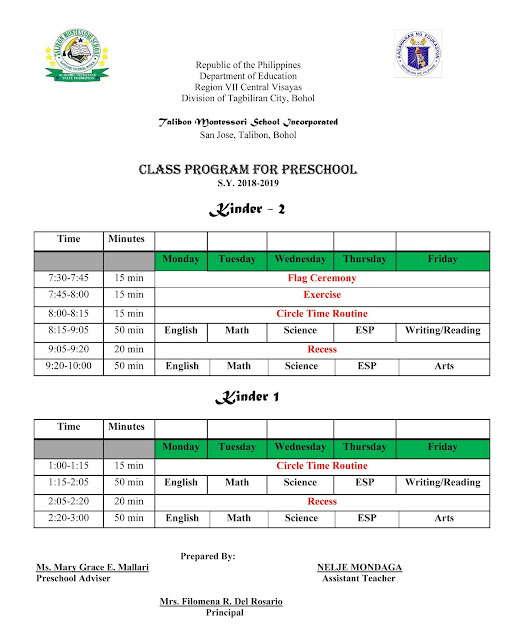 Click here to download the class program.